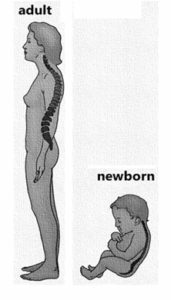 As children grow, the shape of the spine slowly changes from a C-shape in a newborn into a double-S-shape during adulthood. In the field of medicine, research has shown that the exact shape of this double-S is an important factor for the onset of a variety of spinal diseases, such as low-back-pain, ‘bad posture’ and scoliosis (lateral spinal bending). In addition, there is increasing recognition of the importance of the pelvis for maintaining the balance of the spine in the upright position. Previous research showed that the pelvis is the fundament and key factor determining the contour of the upright human spine. For example, by forward and backward rotation around the hips, the pelvis changes the double S-shape of the spine and keeps the mass of the body and the head straight above the pelvis. Fig. 1. As children grow, the shape of the spine slowly changes from a C-shape into a double-S-shape. Compared to our ancestors, the way humans, also known as Homo sapiens, walk completely upright on two legs is unique, and is different from other species that walk on their rear limbs. The major difference between apes in the upright position and humans is that humans can stand upright, while simultaneously being able to backward swing their thighs and extend their knees for forward locomotion. In contrast, human’s closest relatives, apes can stand upright by backward bending their spine with their legs straight, but need to bend their hips or knees to walk forward. Already in the 1950s anthropologist Washburn observed differences in pelvic shape between apes and humans and pointed out the role of the pelvis as a crucial step towards our two-legged locomotion. The major difference was the lever arm of the hamstrings attached to the pelvis. If an ape were to assume an upright position as modern humans do, they would bring the upper legs very near to the part of the pelvis where the hamstrings attach, diminishing the force of the hamstrings. This unfavorable leverage of the hamstrings means these muscles cannot ‘power’ the hindlimb in a fully erect gait. In this research study, we investigated the shape of the pelvis in different great ape species, pelvic fossils of two human ancestors and 500 modern humans (children and adults) to better understand the development of two-legged locomotion during evolution and during pediatric growth. The pelvis of the different species were compared using measurements on computed tomography scans, as used in modern spinal medicine. For the apes, four cadavers of different apes (Chimpanzee, Bonobo, Gibbon and Siamang) were collected from the local veterinary university. For the human ancestors that were more close than apes, pelvic fossils of a 3.2-million-year-old Ethiopian fossil of Australopithecus afarensis (AL 288-1), popularly known as “Lucy”, and an official replica of the 1.6-million-year-old complete pelvis of the Homo ergaster (KNM-WT 15000), popularly known as “Turkana Boy”, from Kenya were used. Those species were compared to scans of modern human pediatric and adult patients. Fig. 2. Apes typically display a flexed hip, bent-knee posture when standing upright to cantilever their C-shaped spine using their hamstrings. Due to a backwards-bent pelvis, humans are able to stand upright with straight legs below the pelvis. By this comparison of the pelvis during evolution, we observed an increase of backward bending of the pelvis: the angle between two major bones of the pelvis (iliac and ischiac bone) changes from minus 4° to 12° in apes, to 20° to 24° in the hominin fossils, to 19° in modern children. Thereafter, the angle still increases during growth into 26° in adult humans. 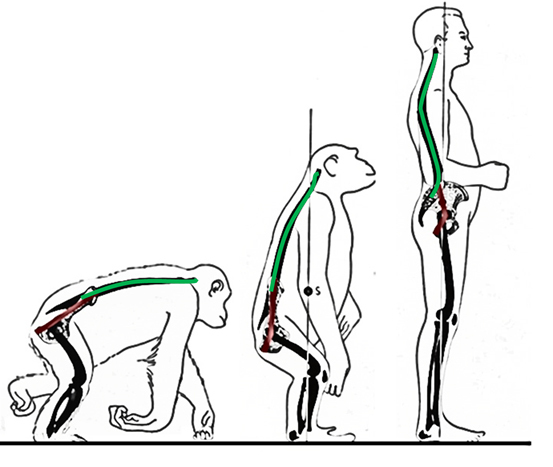 From our perspective, comparison of the pelvic shape among four apes, two fossils, and modern man shows that the changes of the pelvic shape are part of the evolutionary requirements for a well-balanced upright spine. Moreover, the changes of the pelvis during pediatric growth, seems to be an adaptation, necessary for creation of a pelvis that is able to support a trunk straight above it while still providing easy two-legged locomotion during the rest of our life. In the future, further study into pelvic shape may help to better understand the development of different spinal pathologies. The odyssey of sagittal pelvic morphology during human evolution: a perspective on different Hominoidae.